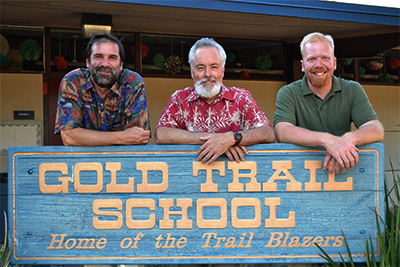 After serving more than 35 years at Gold Trail Union School District (GTUSD) as a teacher, principal, and superintendent, Joe Murchison deservedly entered retirement at the end of June. He has spent the last several decades cultivating a culture of family at their two school sites – Gold Trail Middle and Sutter’s Mill Elementary Schools. Generation after generation of students returns with their children and grandchildren to teachers who are received more like relatives than educators. To commemorate Superintendent Murchison’s contributions, a massive, whole district farewell celebration including teachers, students, and staff was held in his honor. One morning at the end of the school year, Sutter’s Mill students were all bused to Gold Trail where the student population congregated on the large blacktop for the festivities. The program included teachers from both sites performing a choreographed dance to Frank Sinatra’s New York, New York and a flash mob made up of every student. Everyone bid Joe ‘farewell’ with a final, joyful, tearful sing-a-long dance to Elton John’s Rocket Man. For more about GTUSD and its schools.